The Practice Management Rotation at Auburn University’s College of Veterinary Medicine is unique among the clinical rotations that students complete during their final year of veterinary education. 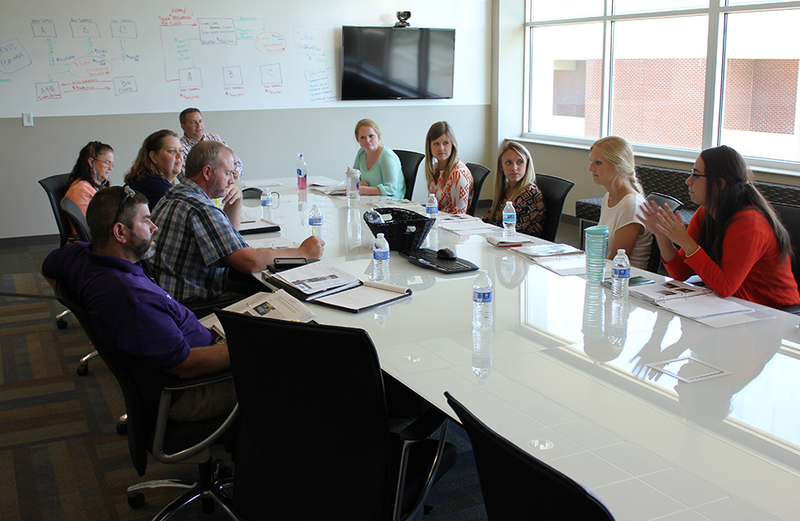 Practice Management Students meet with the owners of Lone Oak Animal Clinic. Rather than medical or scientific skills, the rotation curriculum is centered on preparing students to understand and potentially manage the business side of veterinary practice. Ethan Dawe, an independent financial consultant, instructs the rotation and is committed to ensuring that students are prepared to face the challenges of business management and be successful in their own practice. “The key of this rotation is that students can see what an actual practice is like, everything from finances to client interactions, without the strain of owning that practice themselves, and seeing what works and what doesn’t,” Dawe said. Students begin the two-week rotation by visiting with a host practice, selected from businesses owned by Auburn veterinary alumni, observing client interactions and work flow, finances, facility layout and management, and many other facets of the practice. Students then prepare a 75 to 150 page report on the business’ practices, which is presented to the owners in a conference on Friday. This presentation includes students’ observations and recommendations to improve the practice. Each student is assigned to a specific area of the practice, and focuses on that area while preparing and presenting the report. Madison Gordon, a fourth-year veterinary student from Mobile, covered the financial statements over the past three years of a practice during a recent rotation, as well as observing several appointments. 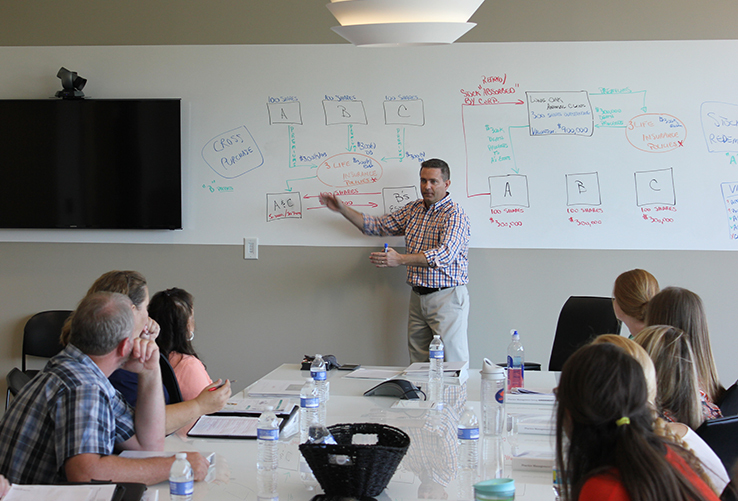 Ethan Dawe gives presents an example financial plan to the owners of Lone Oak Animal Clinic. Dawe emphasized that the intent of the rotation is not to be critical of the practice being evaluated, but to bring value and improve the efficiency of the business. 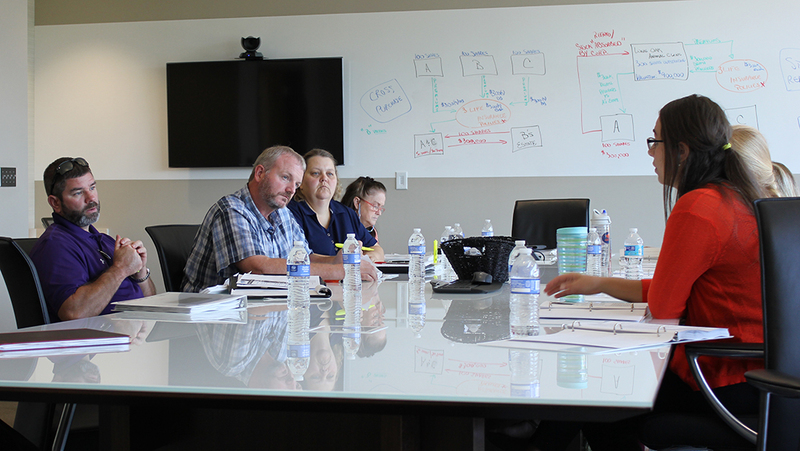 Recently, students completed an evaluation of Lone Oak Animal Clinic in Paducah, Ky., and the owners were pleased with the experience, and especially with the students. The rotation is sponsored by Zoetis, and is free to any clinic that chooses to participate; the only cost veterinarians are asked to cover is the cost of travel and lodging by the Auburn class. To be eligible, practice owners must be veterinary alumni of Auburn. Dawe wants more veterinary clinic owners to be aware that the service is available, and it benefits their practice as well as the future practices of Auburn’s veterinary students. Students in discussion with Lone Oak owners about their findings.